I had fun making this card for the D.T. 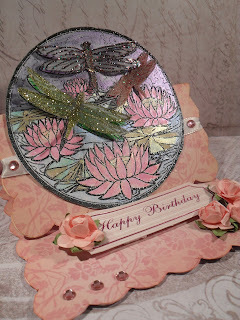 of Fashionable Stamping Challenges, I sat quite happily playing with paint. I love butterflies but dragonflies can be just as pretty with sparkly wings. I used an old Creative Expressions wooden stamp, it's amazing how with the boom in clear stamps, I suspect because of storage, how much cheaper you can buy the wooden stamps at craft events. This is good news for me, for being a stampaholic I love and cherish stamps of any type. I particularly love this stamp for using Luminate H2Os and or mica powders, of which I have on this card. It's such a shame when the shine doesn't show but you can see a little of it on the right side. I also glittered the dragonflies wings. As it is a small card, I decided to make it into an easel card to give even more of an interesting shape. Please pop onto our catwalk on the main blog to view my fellow DT Fashionettes, for the samples are simply stunning. We know you can provide us with some amazing projects, so please let us see them. Sadly, I am experiencing problems, along with many others I believe who use Internet Explorer, with our own commenting page and those of others, not everyone, but it is making it impossible for me personally to add comments onto other blogs, But I will be trying, most of the team are fine so we will be visiting you. You have two weeks and I an hoping this problem is resolved very soon. There is an amazing prize for the chosen winner. Come on ladies let us see you strut your stuff. Caz, I have the same blogger problems, so am using Chrome! What a beautiful lily pond scene you have created in you easel card. I love it and those shimmering dragonflies! Have a great Sunday! Caz its gorgeous, brimming with interesting details and beautiful colours. p.s still having problems as well. A beautiful card to enlarge and look at the colours and details Caz. I love it. Beautiful shimmer and the colours are gorgeous. A beautiful easel card, full of glitter and great details. Beautiful image on this card Caz and it does shimmer. The dragonflies look gorgeous hovering above the water.